Armstrong's	EPB lifting magnets are switched on and off by an integrated battery. They are extremely powerful, compact in size, and can be easily controlled at its front panel or by a wireless remote control to safely lift flat or round loads. 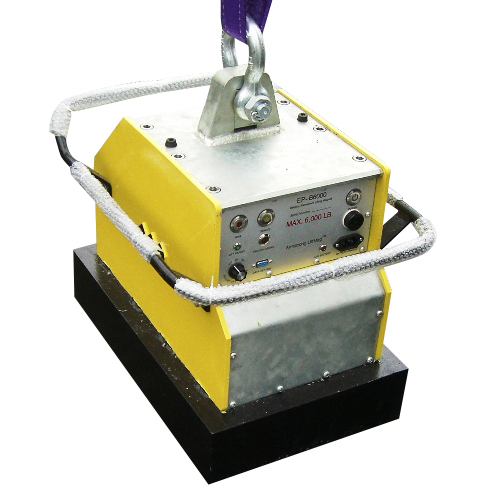 Electro permanent lifting magnet system has an internal battery, which uses the electricity for less one second to activate or deactivate lifting power. The magnet doesn’t need any battery power after it is activated. The battery can work for up to 300 operational cycles of MAG - DEMAG (magnetize and demagnetize). After clicking on the MAG button, a partial magnetization is processed and therefore a partial lifting capacity is achieved. A few seconds after the lifting magnet and the load are lifted off of the ground (or the hoisting rope has a tension), a full magnetization is processed automatically and lifting magnet then reaches its full lifting capacity. With this special mechanism, as long as the lifting magnet can lift the load from ground with its partial capacity, a full magnetization or lifting capacity is more than sufficient for safe lift of the load. This precautionary design enhances safer lifting operations. Adjust the lifting capacity in 3 levels, MAX, MID and MIN, by turning the knob of ADJUST LIFT CAPACITY. In the case that the lifting magnet lifts more than one steel sheet from a stack at a time, you can adjust its lifting capacity to a weaker level in order to lift one sheet only. With the options of three levels of lifting capacities, individual thin metal sheet can be lifted from its stack. Otherwise the lifting capacity should always be set at MAX. 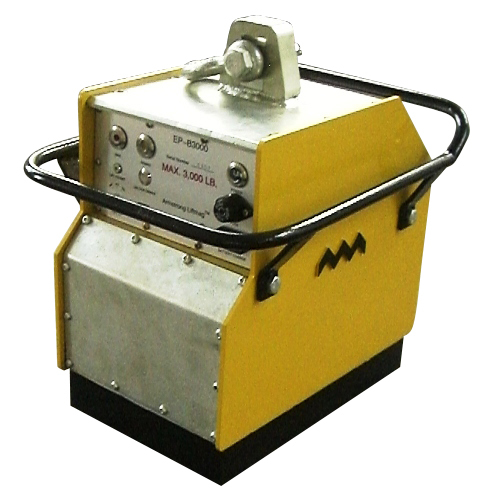 The electro permanent lifting magnets can be operated at its front panel, and/or by a remote control. When the electro permanent lifting magnet lifts the load off of the floor, its lifting power cannot be switched off by clicking on any control button. Light warning if there is no full magnetization or demagnetization. For more safety ensurance, you would have to press on both the DEMAG and UNLOCK DEMAG buttons simultaneously to demagnetize EP-B electro permanent lifting magnet and release loads.